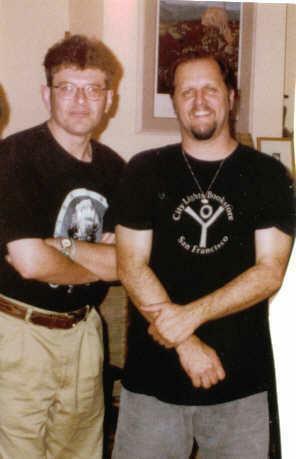 I met Jimmy LaFave in the early 90’s at the Threadgills in Austin, TX during one of my first american tour. I was there with my best friends Donnie Price and his wife Cindy Russell Price. That night unexpectedly Cindy came to me and she told me: “Hey Jimmy LaFave is here. You have to meet him”. So we met him and we took a picture together. Then the musicians who were playing there started to invite other musicians to sit with them, so I found myself playing with Jimmy on that stage. american music, to get cds and connect with american musicians. When I first went to the States, to me it was really “another world” that become the title of one of my cd. The day after that jam session, I went to a record store in Austin, TX and I bought a lot of Jimmy LaFave records. When I came back home to Italy I started to listen Jimmy’s records and I was captured. It was like if “I saw the light”, you know what I mean? He sings like an angel and his voice in those days really reached my heart and my soul. Also my wife Angelina, who is always with me and follow my dreams, was there and of course she was also charmed by Jimmy’s music. She became a huge fan of him. When Jimmy released “Buffalo return to the plains” Angelina found a coupon into the cd booklet and with this coupon you could adopt a bison. So she said to me “if Jimmy suggests us to adopt a bison we have to do it. It will be for sure a good thing”. And she did it. At that time it was not easy: no internet, no fax, nothing but phone. Angelina called this foundation in Oklahoma. They asked her in full wonder: “Are you calling from Italy to adopt a bison????”. Finally she adopted a bison named “Sweet Pea” and after some months she gets by mail her adoption certificate with the picture of Sweet Pea that is still hanging on her studio wall. In 1998 I went to Texas to record my first “american” cd. I had many american artists guests on it, from Jerry Jeff Walker to John Inmon, from Ponty Bone to Champ Hood and many others. “Nuther world” was the title of the cd and it was a dream came true. Six months before we went to USA to record this cd, Angelina wrote a letter to Jimmy LaFave telling all our story and asking how much would have been great to have him singing on the cd. That letter had never had answer. Angelina’s dream was to have Jimmy LaFave singing on that cd. She really loved him. She loved his voice and his music. She asked to everybody in Austin, TX how to contact him to ask if he could come and sing on the record. Nobody couldn’t reach him. We were ready to come back to Italy without Jimmy’s voice on the record. Few days before we left USA, with the cd almost finished, me and Angelina went to the Continental Club in Austin, TX to listen some music. I was talking with someone close to the entrance and Angelina was seated in the audience. Unexpectedly I saw Jimmy LaFave entering into the club. I went to Angelina and I told her “Hey Angelina, you will not believe but Jimmy LaFave is here”. She was like thrilled. She was shy but bravely went to him. Here what Angelina told me later: “I went to Jimmy and I introduced myself, I told him: “My name is Angelina and I come from Italy”. I saw that Jimmy had a necklace with a bison so I told him: “Do you know Jimmy that through one of your cds I adopted a bison?”. He was really impressed. I told him our story and that we were finishing to record the cd (actually the cd was already finished but I lied) and that we would wish to have him singing on the cd. He looked at me and he asked me: “Tell me one more time the town where you come from?” and I answered: “Voghera, Italy”. He told me “You wrote me a letter” and I said: “Yes”. The day after the tape recorder in the studio broke, bad luck. The sound engeneer called Jimmy to ask if he could come later. We all were very worried: maybe he was busy and he couldn’t come later. But he did. Angelina was so happy and excited. I was in Heaven. He learned the words of a song I wrote and we recorded that song as a duet. was his fee and he answered with a big smile: “When I will come to Voghera, you will cook for me a big spaghetti dish and I’ll be fine and happy”. Since then Angelina and me we are always waiting for him here in Voghera, Italy. And we will always wait for him. This entry was posted in Stories and tagged Bob Dylan, Chicken Mambo, Fabrizio Poggi Jimmy LaFave, Jimmy LaFave, Midnight song, Stories, Texas, Woody Guthrie.